Cook pasta as directed on package; drain, reserving 1/2 cup cooking water. Return pasta to saucepan; cover to keep warm. Meanwhile, in large skillet, melt butter over medium heat. Cook onion and garlic in butter about 5 minutes, stirring frequently, until onion has softened. Add sun-dried tomatoes, oregano, pepper flakes, salt and capers. Cook 3 minutes longer. Stir in shrimp. Cover; cook until shrimp just turn pink, about 5 minutes. Stir in lemon juice. Gradually stir in reserved pasta cooking water. 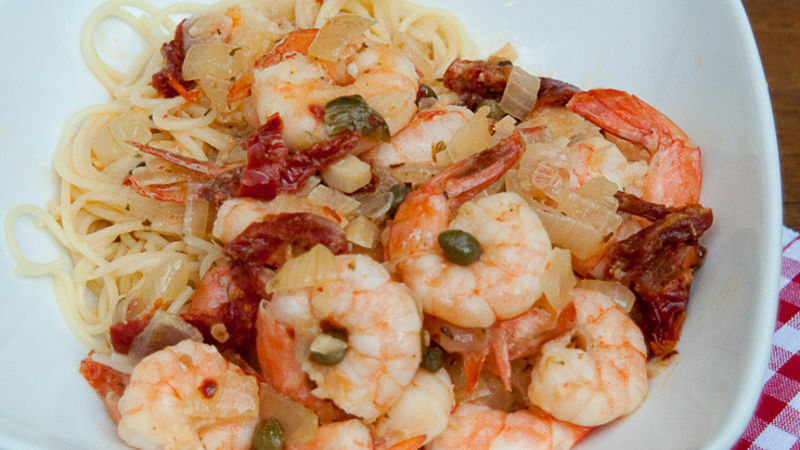 Add pasta to skillet; toss with shrimp and sauce. Serve immediately. If using frozen shrimp, thaw shrimp completely, drain well and pat dry to remove excess moisture before adding to the sauce. Dry-pack sun-dried tomatoes may also be used in this recipe. Any long pasta shape, such as linguine or spaghetti, can be substituted for the angel hair. If you like fresh basil and have it on hand, add 1 or 2 tablespoons of chopped basil at the end of cooking time. For even more Mediterranean flavor, top with 1 cup crumbled feta cheese (4 oz) just before serving.